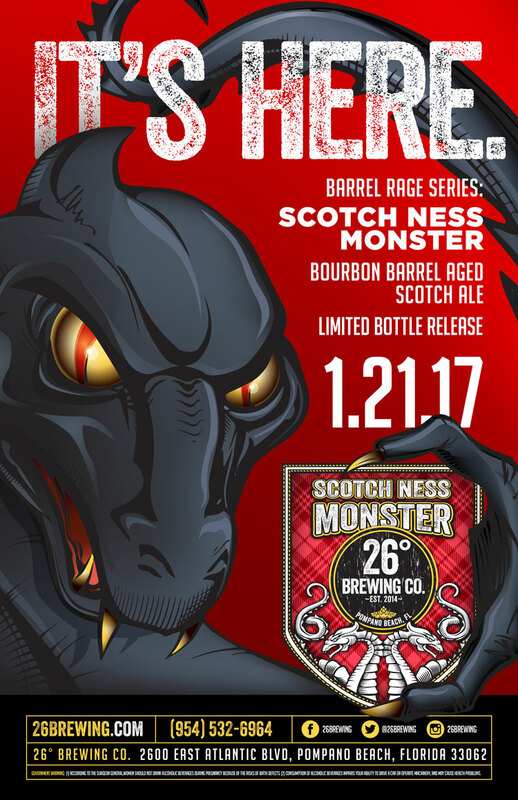 The Scotch Ness Monster is back for vengeance, with the first Barrel Rage Bottle Release of 2017. After six months of lurking in the depths of a bourbon barrel, Nessie’s ready to pounce on unsuspecting taste buds. Brewed in the classic U.K. style then aged in the Barrel Rage tradition, this “Wee Heavy” Scotch Ale boasts a full-bodied, rich flavor with subtle hints of caramel, smoky peat, oak, and bourbon for a transcendental expedition into the dark side. Be one of the first in line on Saturday, January 21, 2017 for the extremely limited bottle release of the Bourbon Barrel Aged Scotch Ness Monster. The Bourbon Oak Barrel Aged Scotch Ness Monster will only be available in 750 ml collector’s bottles and on draft in the taproom during release day. While we will open and close at our regular times (from 12PM – 1AM), Scotch Ness Monster bottles will be released at 2PM.